Share the post "Africa: The Digital Awakening"
From the evolution of hominids to the era of wars, Africa is always the cynosure of global economies. The African safari has been interspersed with war, corruption, and poverty for a long period. However, in the past decade this has changed, as Africa embarks on a developmental journey by embracing ICT, and welcoming the digital revolution improving the means of communication. Huge investments in ICT infrastructure has propelled digital revolution across the vast landscape of the continent. Never before has the continent experienced the need to communicate, thereby enhancing business opportunities, bolstered by social media. In the fund-starved economy, online crowdfunding initiatives have seen the light of the day by helping develop the innovative homegrown ICT products and services, and aiding economic development. In the words of the Ghanaian economist, George Ayittey, the “Cheetah Generation” (people whom the government has laid down but proactively want to reshape the economy), are assisting rebuild their economy by utilizing digital platforms. In a continent where internet infrastructure still requires a ramp up, social media penetration has already started to sway public sentiments at large. According to the World Bank, internet bandwidth in Africa has increased 20 folds in the last five years, thus opening many opportunities for the development and support of homegrown service providers, which would rebuild the economy, lampooning for a long time. ICT is helping transform Africa’s competitiveness to its developing counterparts and has made inroads for digital as a part of daily lives in many countries across the continent. There are more than 650 million mobile subscribers in Africa, which is much more than the developed superpowers, which includes the USA and the European Union. This has opened a new business opportunity for digital marketers in Africa, where they reach consumers with more targeted content right in their homes. However, Africa needs more PCs, laptops, and better internet infrastructure to sustain and perpetuate the development in the ICT sector. It is amazing to know that Africa is the only continent where revenue from mobile phones is higher than fixed lines revenue. Kenya, Ghana, Uganda, Rwanda, Algeria, Botswana, South Africa, and Mauritius are rapidly driving the wheels of development towards becoming informational technology hubs in the continent. Mobile data usage in Africa is nearing 15% of the total internet traffic, just second behind Asia. 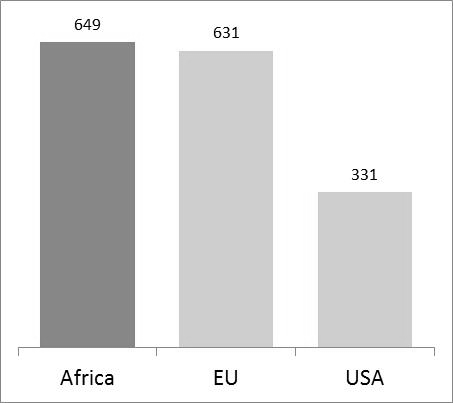 South Africa and Nigeria are recording more than 80% login on Facebook through mobile devices. Digital revolution in Africa has struck the right chord with technological advancements providing a structural framework to augment economic development. In the vast African expanse of one billion people, the market dynamics and consumer behavior changes in each country. Social media sites like Facebook and Google+ were quick to realize the market demand and customized their platforms in Swahili (east & central Africa), Zulu (South Africa), and Hausa (Nigeria/West Africa). Bitten by the social media bug, 95% South African brands have already established their presence on social media platforms while brands still need to gear up, for an effective social media presence. In a 2011 report by the Kenya ICT Board, internet penetration in Kenya is close to 30%, which is ahead of South Africa. 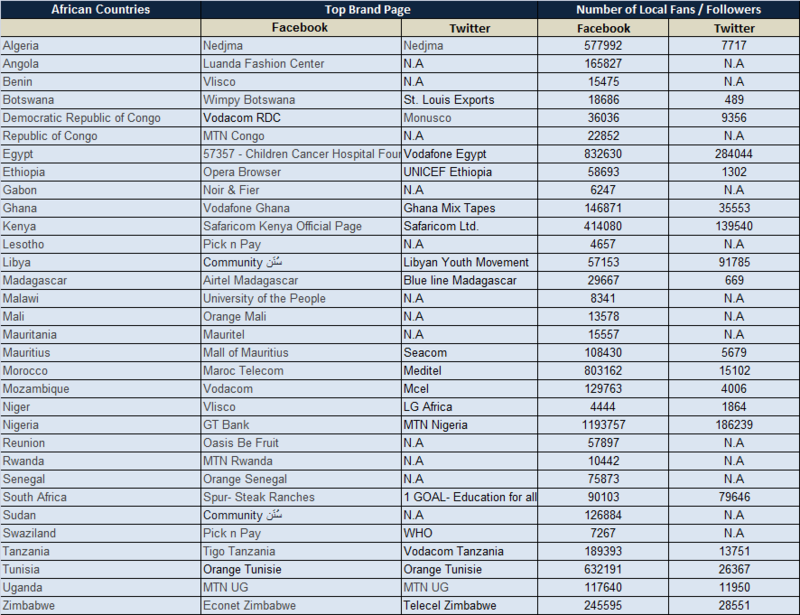 Out of the 10 million-internet user in Kenya, 20% are already actively present social media sites. Airports and shopping malls have emerged as common check-in locations on Facebook in South Africa. Africa’s own social media platform Yookos boasts of more than 20 million subscribers. Another networking site, based in Lagos, LAGbook targeted at youth (18-30 years) started in 2010, already boasts of half-a-million registered members. Marketers in Africa are expected to increase the expenditure on digital advertisements from 4% to 35% by 2015, as per the report by Deloitte Touché. This would usher a new wave of digital marketing for the tech savvy brands. “Village in Action” became the first Diaspora led development project, crowdfunded through online initiatives. ThundaFund, a local crowdfunding platform in South Africa, aided by social media has raised ZAR 105, 000 and plans to increase the figures to ZAR 155 million over a period of next four years for over 3,300 projects. With all the actions on, Africa is geared to harness the real potential of social media in the globalized world. However, the continent needs to channelize this opportunity created by social media platforms towards economic development by driving entrepreneurship. Africa still lags the intellectual and technological capabilities required to compete with advanced states in the global economy. In countries such as Malawi, and Zambia, the government controls the power of free speech, granted by social media, which puts the veil on development and economic competitiveness of the region. Let us look at some of the key area where digital awakening in Africa could help the marketers in day to come. Online Communities – Social media platforms could serve as a great medium to help develop the intellectual facilities in the form of online communities, thereby promoting online educational courses and peer-to-peer online learning activities. This will help make the consumers more informed and provide an opportunity to brands to interact with them digitally. Mobile revolution – As the mobile revolution unfolds in Africa, digital marketers have an opportunity to capitalize on the rising trend and make their brands mobile centric, and target consumers with location-based offers and adopt social development issues in their digital campaigns to incite consumers. Customer engagements – Social media savvy brands need to optimize their social media updates and indulge in discussions with consumers. They must not only restrict themselves to providing answers for consumer queries but also show concern through initiatives towards social upliftment, job creation, and strive to empower consumers as brand proponents. Amid the high and lows of digital awakening in Africa, the continent has witnessed the dark as well as potential good aspects of social media, in its nascent stages. The respective governments are busy formulating policies and drafting regulations, which would help increase internet penetration in respective countries. This would further enhance employment opportunities by utilizing digital platforms. Development of a positive business environment, which promotes entrepreneurship, would lead to economic development of the society, providing opportunity for marketers to cash on the neo-rich consumers in the budding economy. Africa has always been the point of interest for all. Let me know your thoughts on how digital awakening is transforming the business environment in Africa.